"We were recently notified by Epsilon, a marketing vendor used by Marriott International, Inc. to manage customer emails, that an unauthorized third party gained access to a number of Epsilon's accounts including Marriott's email list. In all likelihood, this will not impact you. However, we recommend that you continue to be on the alert for spam emails requesting personal or sensitive information. Please understand and be assured that Marriott does not send emails requesting customers to verify personal information. We take your privacy very seriously. Marriott has a long-standing commitment to protecting the privacy of the personal information that our guests entrust to us. We regret this has taken place and apologize for any inconvenience." Data breaches are inevitable. This was not Marriott but a third party used by them. I applaud Marriott for being timely and honest with their news. This is what I call good customer service. I will continue to use Marriott. In fact, I just left one this morning in Mexico City and have another one booked for next month. 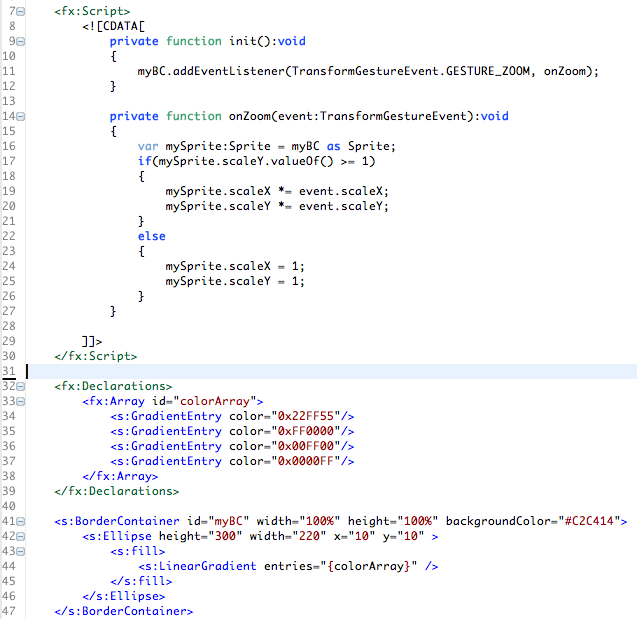 The example code below provides a quick look at how to register an event handler for TransformGestureEvent.TRANSFORM_ZOOM. Line 11 adds the event listener to the BorderContainer (line 41). The Transform event is passed to the onZoom function on line 14, which has a member variable of type Sprite. By reading the scale of the event's scaleY property, you can enforce a minimum size as shown by the if-else statement on lines 17-26 and assign the new values. Note that the minimum scale size this can go to is 1. This is to prevent users from scaling the Sprite too small to place both fingers on it to zoom again. The code may be downloaded from here. You will need Flash Builder 4 and AIR 2.5 or later to run this.